All things must pass, as the late George Harrison famously sang. Bittersweetly, this now applies to the 2017 Boardwalk Summer Concert Series at the Music Pier. 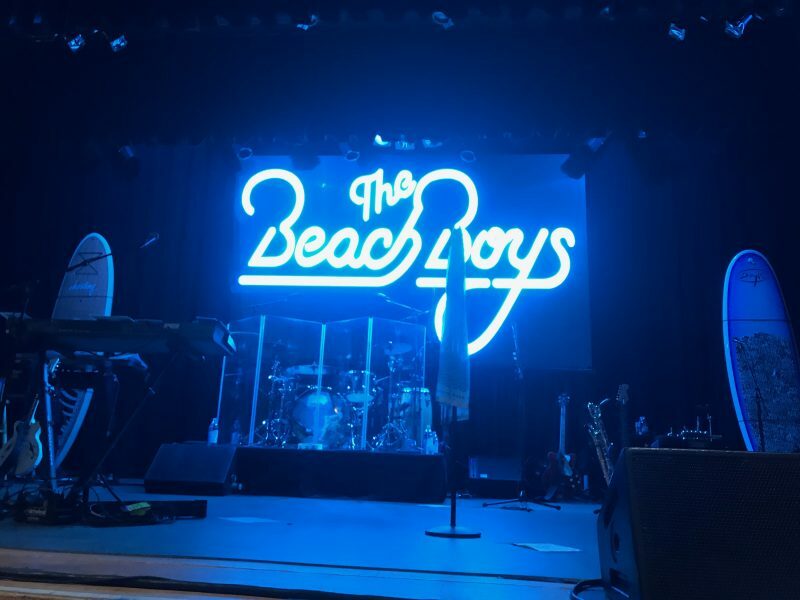 It will also, one day, apply to the Beach Boys’ annual summer pilgrimage to Ocean City. While the current lineup misses a trio of Wilson brothers, plus others, who helped create earlier musical magic, they remain an outfit worth appreciating while they get around. 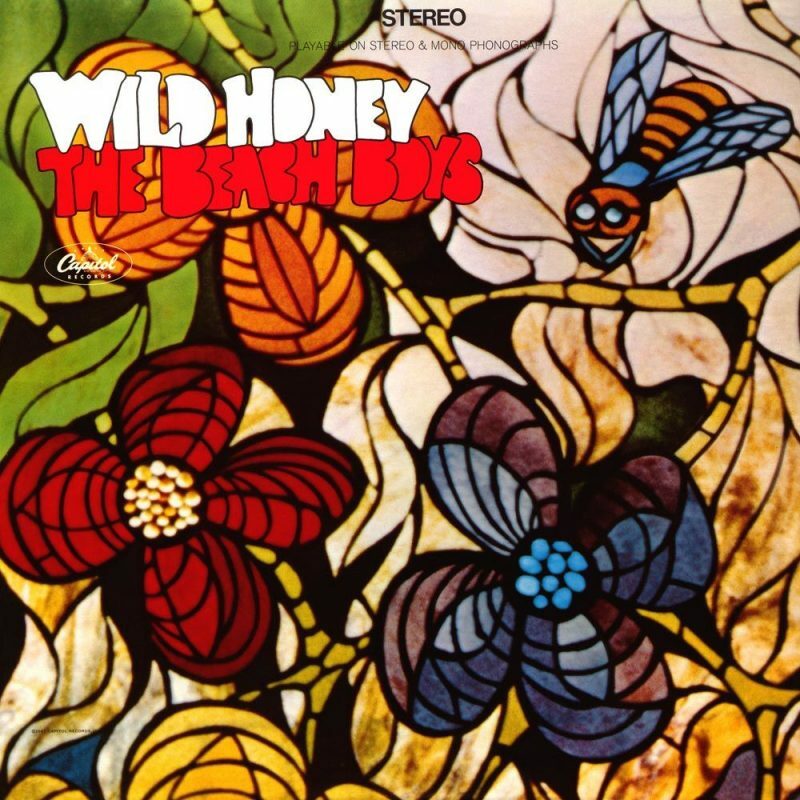 The 2017 edition of this trek, was billed as the Wild Honey Tour, after their 1967 R&B/soul album, celebrating its 50th anniversary in December. Wild Honey was released months after plans to release an ambitious double-album follow-up to their classic Pet Sounds, called Smile, were scrapped. It was an album that saw producer/leader/co-founder Brian Wilson ceding control, beset by personal problems. Wild Honey was well regarded critically, and displayed more of the band’s range, but was their lowest-selling album to date. 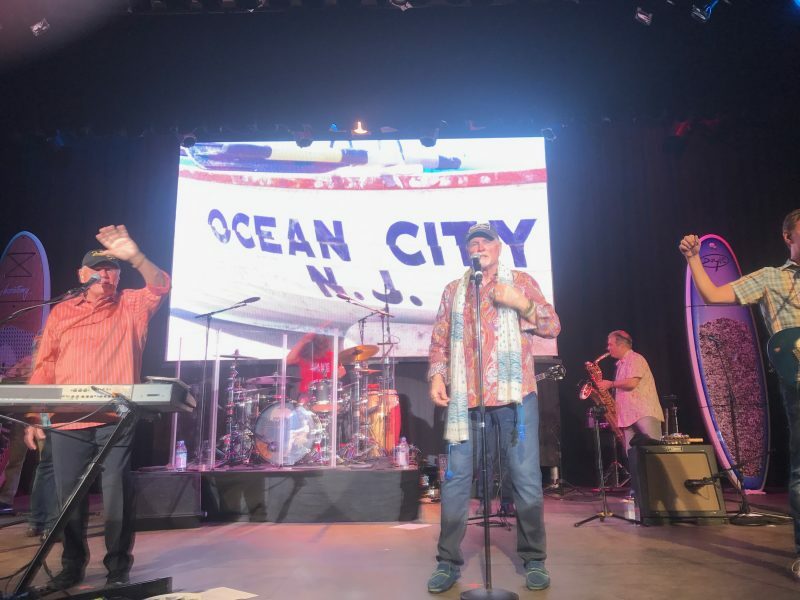 Perhaps due to its lack of hits, only one song from it, “Darlin”, which Mike Love cited as a personal favorite when speaking to OCNJ Daily, was performed Tuesday night. To the patrons packing the Music Pier for four shows over 48 hours, a little dose of Wild Honey was alright. These fans were really here to hear the sun-soaked classic singles. Iconic hits that provided the soundtrack to their youth, later American Graffiti, and eventually passed down to their children and grandchildren. All three generations were well represented in the 6 PM early bird crowd. Love, the co-founder/lead-singer/longtime-leader of the band’s legacy, hasn’t kept this band alive all this time by not knowing what his customers want from a live show. Following an entertaining montage of archival clips played on a big screen behind them, the band got out the gate quickly. 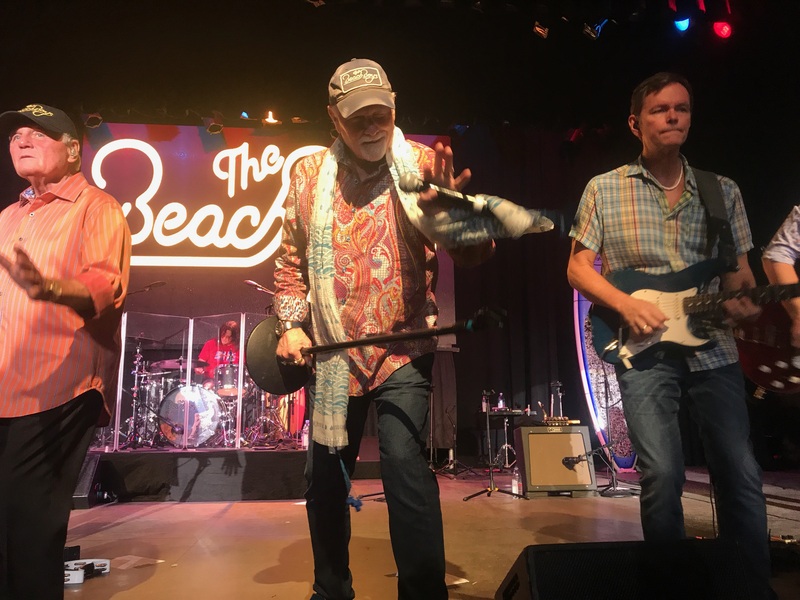 A slew of familiar hits, from the earliest years of the Beach Boys career, set the tone: “Surfin Safari”, “Surfin USA”, “Catch A Wave”, “Surfer Girl”, “Little Honda”, “When I Grow Up to Be a Man”, and “Be True to Your School”. Mike Love’s transcendental meditation appears to be working wonders. At 76, he looks at least ten years younger. This is aided by an alcohol-and-drug free existence, coupled with exercise and healthy diet. A dining regimen that takes a break each summer, once he reaches this Jersey shore destination. Early into the first of two Tuesday night shows, Love observed, “Is this place (the Music Pier) awesome or what?!? You can look at the waves, while you’re singing about them. We look forward to coming here, every year. You can get diabetes in a day in this town. I had so much ice cream yesterday, it was crazy”. Those with a sweet tooth for ear candy got a full parlor’s worth. Yet some of the most affecting songs were malted in melancholy. “Don’t Worry Baby” was pure beauty, with guitarist Scott Totten laying the lick on the song’s trademark tasty solo perfectly. The choral effect on “In My Room”, lent credence to Love’s pre-show touting of the current lineup’s vocal depth. One of the more moving moments, for reasons both obvious and unexpected, was “God Only Knows”. 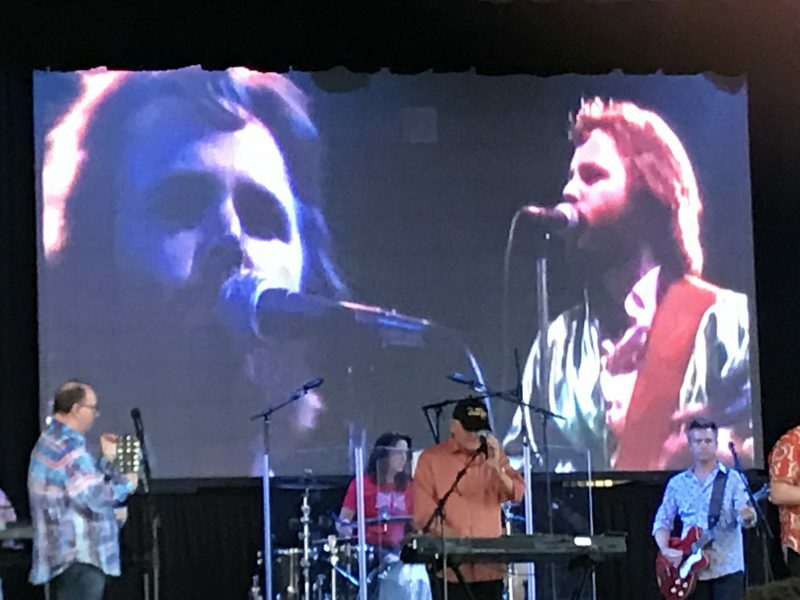 Rather than tap someone else to sing Carl Wilson’s lead, they utilized an isolated vocal from video footage of Carl singing it live. This gave a classic, already considered one of the greatest songs produced in the 1960’s, even further gravitas. At its conclusion, Love, lamenting Carl’s death from lung cancer in 1998 noted, “we’re lucky to have technology, so we can back him up again every night”. Ghosts of the past were a fixture, both in the music, and on the accompanying screen, all evening. There were video clips displaying swaggering mayhem of Dennis Wilson, who died in a drowning accident in 1983, on drums. Home photos of the Beach Boys and Beatles, with the Maharishi in India 1968, accompanied a tribute to the aforementioned Harrison. The still-living Brian Wilson, made frequent appearances alongside his band mates onscreen, but was conspicuously omitted any mention from the stage. One of the evening’s biggest surprises, for this author, was the appearance of “Sail On, Sailor” in the set. 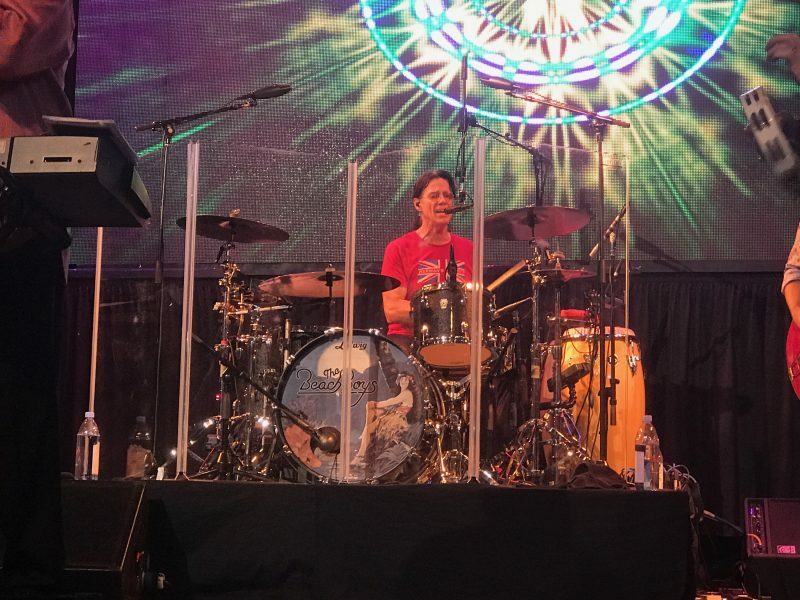 Drummer John Cowsill performed the lead vocal, originally recorded by Blondie Chaplin, from behind the kit. We try to not be self-referential here. But it’s hard not to wonder, whether this underappreciated gem resurfacing was connected to our conversation about it with Love earlier this August. Being admittedly curious enough to check summer set lists, they didn’t play the song until shortly after that chat. So that could be the case, and if it is, many thanks, Mr. Love. Not everything about the sunny exterior of the music shined. 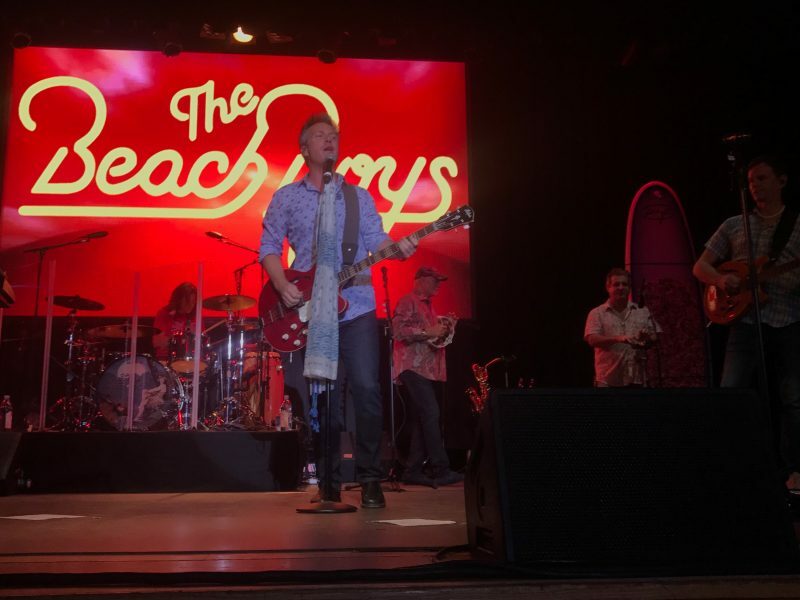 While Love’s bass notes still boomed inside the Beach Boys’ doo-wop infused harmonies, his nasal baritone leads could have used some volume assistance in the mix at times. 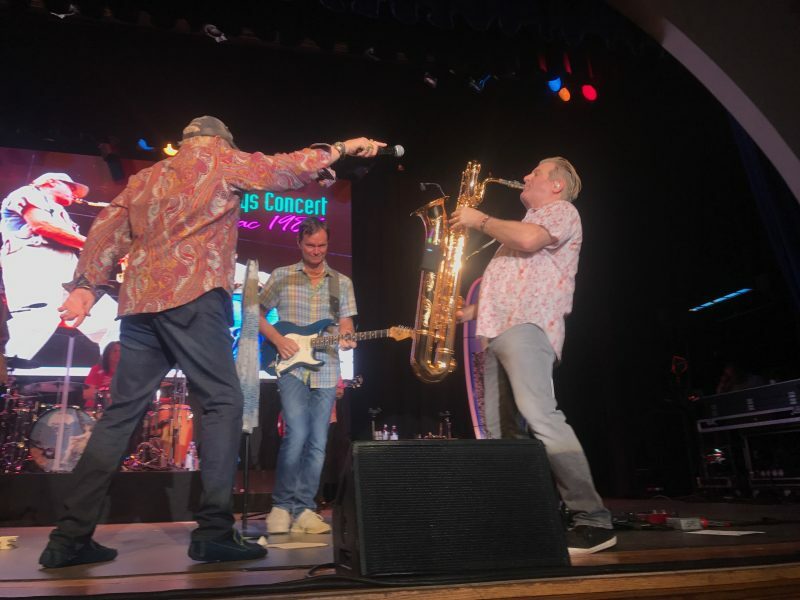 Bruce Johnston’s presence is a welcome one, due to his being the only other member connected to their mid-sixties heyday. But much of the heavy lifting these days, vocally and musically, is done by touring band members like Tim Bonhomme, Jeff Foskett and Brian Eichenberger. This is not an issue, as long as you know that going in, and calibrate expectations accordingly. Towards the end of the show, there’s a little song called “Kokomo”. Which a surprisingly large segment of the crowd genuinely seems to love. That would not include the person writing this. Thirty years later, it’s less “ear worm”, more tape-worm. 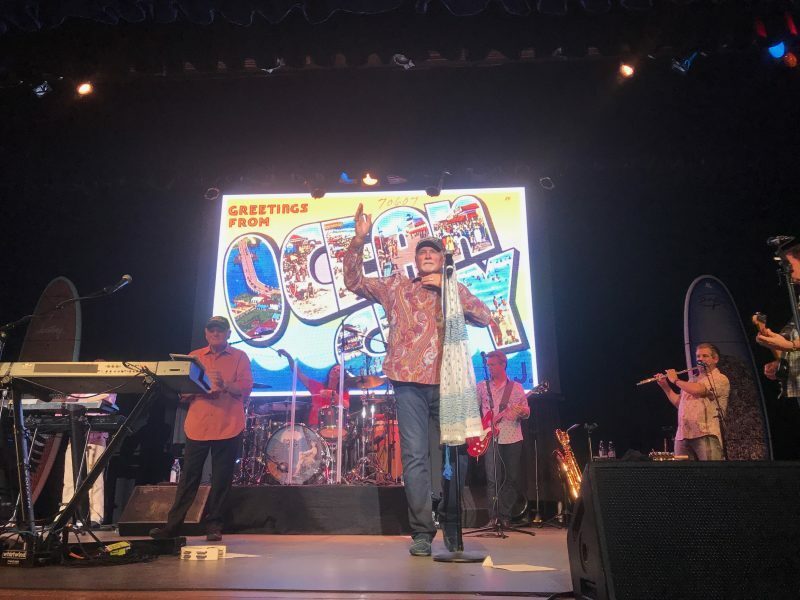 If we’re picking among 80’s Beach Boy songs, we’d take “Getcha Back”, which arrived earlier in both the show’s proceedings, and our MTV memories. The Beach Boys got us back directly after “Kokomo” with another #1 hit, of far more artful caliber, in 1966’s “Good Vibrations”. Those positive vibes carried things through to the show’s “Fun, Fun, Fun” conclusion. After the show finished around 8 PM, the crowd was directed to exit solely from the north side. Some small factions among the satisfied customers, funneling out slowly as classic 60’s soul played on the PA, sang along on their way out to the boardwalk. A new group of smiling faces was lined up outside the Pier’s south side entrance, waiting their turn for the 8:30 show. Summertime, like great bands, you never really want to end.